Levelok is proud to announce the all new streamlined quick connect base unit for the KeyLok ladder leveling system! 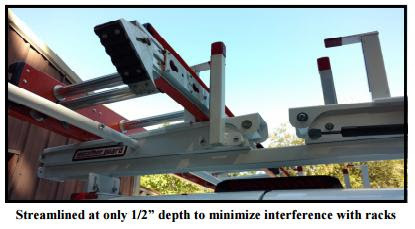 This is a completely new and revolutionary product that is designed to equip almost any fiberglass ladder with a leveling system, while keeping ladders as light and slender as possible. Fits most brands and styles of fiberglass ladders. Helps to maintain ladder’s intended weight and width. Increases versatility while reducing injuries & costs. Extends life of levelers when kept inside van or truck, out of extreme weather. Approved for ladders up to a Type 1AA, 375 pound duty rating. Meets all ANSI and OSHA Standards for Ladders and Ladder Accessories. Levelok Model: LL-QC-3. Interested in getting one for yourself? Buy Online or Call us today at (360) 697-8629 or toll free at 1 (888) 811-1727.